Sony has released a new trailer for Venom, revealing a lot of fresh details about the upcoming Spider-villain spinoff. Venom is hardly your typical Marvel movie; as the trailer declares, "The world has enough superheroes." This new trailer builds on everything Sony has revealed to date, and includes some of the footage shown at San Diego Comic-Con. It also improves on footage from their first teaser trailer, which was heavily criticized due to its lacking CGI. With the nearly-completed effects added, those scenes look far more impressive. Of course, Sony faces a difficult challenge in order to make Venom's origin story work; in the comics, he's strongly tied to Spider-Man, and it increasingly looks as though Sony's spinoffs aren't part of the MCU. Sony have adapted the classic Venom: Lethal Protector miniseries, which saw Eddie Brock cross paths with the sinister Life Foundation. While the villains have been switched up a lot, the core narrative in the trailer will be familiar to any comic book reader. 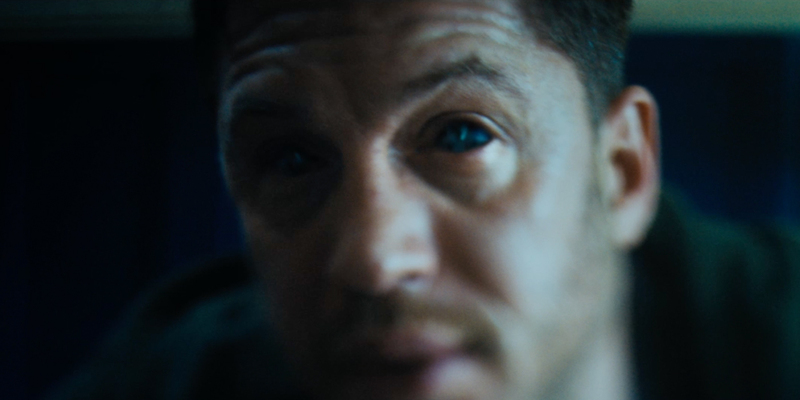 So here's our rundown of all the big takeaways from the Venom trailer. From Eddie Brock's origin to the terrifying threat of Riot, it's time to see just what thrills and chills Venom has in store. The trailer begins establishing Eddie Brock's status quo at the start of the film. He's an investigative reporter, one who seems to have a history of digging into crises the government is turning a blind eye to. In this case, Brock has become interested in the Life Foundation, who claim to be working for the benefit of humanity. There are rumors the Life Foundation takes advantage of the vulnerable in order to conduct illegal experiments. It's fairly similar to Eddie's origin in the comics. There, he was a reporter for the Daily Bugle who dreamed of success. He broke a story revealing the real identity of a serial killer, but tragically he got it wrong, as proven when the real killer was unmasked by Spider-Man. In Venom, it appears Eddie Brock is rather less inept at his job than in the comics, and he certainly seems to have good instincts for a story. Just as in the comics, the symbiotes come from offworld. We've seen the crashed spaceship in other trailers, but this time it's possible to confirm that the crash appears to happen in China, given the writing on the sides of the ambulances. The trailer then gives us a glimpse of multiple canisters being retrieved from the cases - although it carefully avoids revealing just how many of these canisters there are. At least two are visible. In the comics, the Venom - Lethal Protector miniseries introduced saw the Life Foundation successfully create five symbiotic warriors. Although several of these symbiotes are confirmed for Venom, most notably Riot, it's as yet unknown whether or not all five will appear. Eddie's investigation of the Life Foundation evidently leads to a night-time break-in, and he stumbles across one of the symbiote test subjects - identified on IMDb as Scream. She somehow escapes, and attacks Eddie, shoving him to the floor. In the comics, Scream is the most dangerous of the Five Symbiotes, known for the tendrils she weaves from her hair. Although this is clearly the moment when Eddie first comes under the influence of the Venom symbiote, it's unclear quite what has happened. It's possible the symbiote has "jumped" from one host to another, perhaps desiring freedom from the Life Foundation. A more disturbing option, though, is that the symbiote has actually reproduced. In the comics, each symbiote can plant seeds for up to six "children." That's how the Five Symbiotes were created in the original Lethal Protector miniseries; the Life Foundation extracted Venom's five remaining seeds. It's possible that, in this scene, Eddie is implanted with a seed. If the latter is the case, then the symbiotes are reproducing, and each one of them could sire new symbiotes. Carlton Drake has unwittingly released a dangerous force that could transform the world, and there could be any number of new symbiotes. 22. Eddie Has Been "Taken"
This scene seems to be set shortly after Eddie's first exposure to the symbiote, with the journalist suffering from some sort of headache and then - to his outright horror - begins hearing another voice in his head. It all leads up to the moment when Eddie looks in the bathroom mirror and see his eyes have turned pitch-black. In the comics, possession by the symbiote was a fairly immediate event. In contrast, Venom appears to be taking a slow-burn approach, with the influence of the symbiote advancing over the course of the film. Riz Ahmed's Carlton Drake is the villain of the film, and this trailer fleshes out his motives. He believes that the world is at the brink of collapse, with human beings too weak to survive the coming ecological catastrophe. In Drake's twisted ideology, everything he does is justified by a desire to secure the future of the human race. He sees the perfect solution in the symbiotes; a chance to create the next step in human evolution, a blend of human and symbiote; stronger, tougher, more durable, able to endure the threats we are faced with. Although Drake's motives have been discussed in interviews, this is the first footage to confirm them.